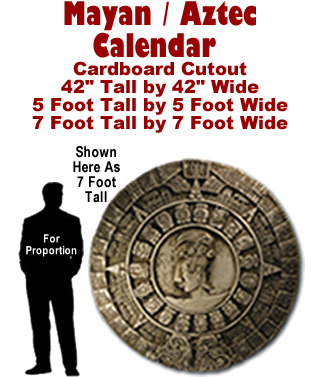 Mayan - Aztec Pyramid Cardboard Cutout Standup Prop - Dino Rentos Studios, INC.
Flat Carboard Cutout- Printed on one Side. 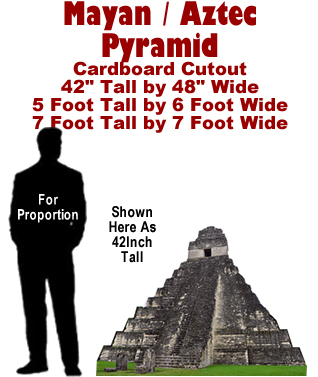 I was looking for a Mayan Pyramid to decorate the gym of a school for International Day. All the ones I found were very cardboard looking until I found this one which is very realistic. When I called to order it, the rep on the phone was very nice and helpful; she said it was going to take 5 business day to have it ready to ship. I was really surprised when 3 days later I had it delivered at my house. It come in big pieces which I had to put together but it was fairly simple. The instructions could be improved, otherwise I was really impressed of how beautiful it looks, specially because I have seen it in the archaeological site of "Tikal". The pyramid was the main focus in the gym and parents took pictures with their children in front of it. 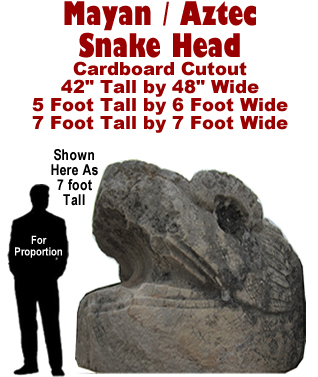 I totally recommend Dino Rentos Studios and this wonderful cardboard prop.